Jewellery brand Saretta creates ‘statement’ jewellery that is unique, unashamedly bold in design and style, and never conforming. Creative Director Sarah Bond founded Saretta with a vision to make wearable couture-style jewellery using ethically sourced precious metals and gemstones. After deciding to convert her lifetime hobby into a business, Sarah trained in London at Central St Martin’s and Sir John Cass Jewellery School, and in 2005 opened the doors of her studio in London’s iconic jewellery quarter, Hatton Garden. As a trained Anthropologist, Sarah spent time travelling to some of the most remote corners of the world, and was directly inspired by her travels and past experiences working with community-based projects in Africa and Asia. Inspiration varies greatly for each collection. From volcanic lava (Lava Collection) to bright city lights and futuristic architecture (Black Magic Collection) to treasure on a tropical Island (Paradise Island Collection), Saretta’s ready-to-wear pieces are young, fun and wearable from day to night. The High Jewellery collection features the finest quality stones, including emeralds, diamonds, sapphires, rubies, pearls and aquamarines that can be sourced, paired with the finest quality metals designed to show off the stones and let their true beauty shine through. Bespoke pieces are a specialty of Saretta, and we create everything from diamond engagement rings to special pieces for anniversaries, push presents and more. Sarah loves to work intimately with her clients, from the inspiration stage, to the hand drawn designs, to the realisation of client’s dreams in the final piece. Through her design and inspiration, Sarah transports the wearer on her travels to experience all that nature has to offer. Each collection is a true reflection of the time and effort that Sarah dedicates to her designs and finished pieces. This flair for bold, impactful yet feminine design has not gone unnoticed by celebrity stylists, who are adorning their clients with Saretta jewellery. 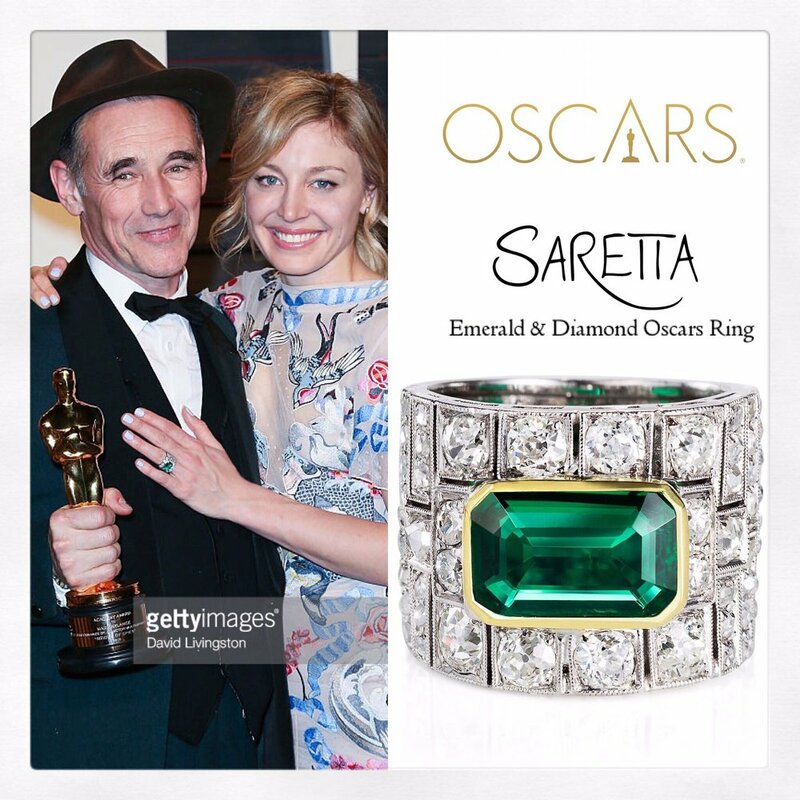 Bespoke emerald and diamond Saretta jewellery was designed and made by Sarah to accompany a Temperley London dress worn on the Red Carpet to the 2016 Oscars by actress Juliet Rylance (who was accompanying her father Mark Rylance, who won the Oscar for Best Supporting Actor). Sarah’s passion for making ethical statement jewellery has also led to a range of accolades including a coveted “Nexgem” award in Professional Jeweller’s Hot 100. Saretta uses recycled precious metals together with a variety of precious and semi-precious ethically sourced gemstones to accentuate the designs, and adheres to the Kimberly Process and uses ethically certified bullion and gemstones from sustainable sources worldwide. Saretta jewellery is proud to be handmade and hallmarked in London.